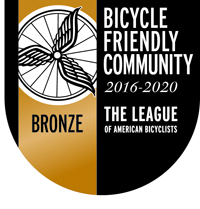 In November 2016, the League of American Bicyclists recognized the City of Brookings with a Bronze Bicycle Friendly Community (BFCSM) award. The Bronze BFC award recognizes Brookings’ commitment to improving conditions for bicycling through investment in bicycling promotion, education programs, infrastructure and pro-bicycling policies. The BFC program provides a benchmark for communities to evaluate these conditions and policies, while highlighting areas for improvement. The program emphasizes that bicycling is a simple solution to many of the challenges we face in our country. As Brookings' residents know well, bicycling is about mobility, sustainability, health and so much more - Bicycle Friendly Communities are great places to live, work and visit.